A blue whale raises its tail above the water surface off the coast of Long Beach, Calif. during unseasonably warm weather on Saturday, Feb. 6, 2016. Blue whales grow up to 100 feet long and weigh upwards of 200 tons. Blue whale tongues can weigh as much as an elephant; their hearts, as much as a car. A baby blue whale emerges weighing up to 3 tons and stretching to 25 feet. And of course, it’s not just blue whales. 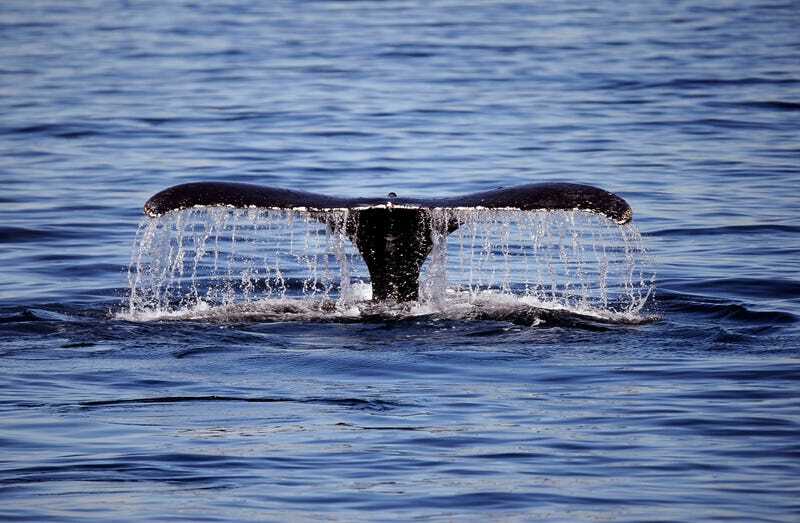 The repertoire of massive marine animals includes sperm whales (weighing as much as a military tank), orcas (just a little smaller than a school bus), and elephant seals (heavier than an SUV). Come to think of it, there aren’t too many “small” marine mammals - where are all the tiny sea mice or bats, scurrying around in the ocean? So, why are marine mammals just so damn big? Researchers from Stanford University might have an answer. By looking at the body masses for 3,859 living and 2,999 fossil mammal species, a team from Stanford’s School of Earth, Energy & Environmental Sciences (Stanford Earth) found that the need to retain heat in a cold, wet environment largely explains why marine mammals are bigger then their land counterparts. The team found that once mammals enter the water, they tend to converge to a weight of around 1,000 pounds. This means that as land mammals made the big blue their home, many had to drastically increase their size. Consider the ancestors of seals and sea lions (which are related to dogs), which likely had to grow rapidly to adjust to their new aquatic homes. But “bigger is better” doesn’t quite cover it here. The team from Stanford found that metabolism increases with size at a faster rate than an animal’s ability to gather food, which can put a boundary on just how big aquatic mammals can grow. Size is only beneficial up to a point - and once marine mammals get large enough they’re plagued by difficulties of getting enough food to survive. “Basically, animals are machines that require energy to operate. This need for energy places hard limits on what animals can do and how big they can be,” explained Craig McClain of the Louisiana Universities Marine Consortium, who was a co-author on the study. So, just like goldilocks, there seems to be a perfect size for marine mammals: definitely not small, but also not super huge. But what about the blue whale? How come they’re so much bigger than other marine mammals? Good question, and lucky for us, Stanford seems to have an answer. Blue whales are filter feeders, which means they expend way less energy on feeding than their toothed counterparts. Sperm whales (the largest toothed whales) have to dive to great depths to feed on their diet of squid, octopus, shrimp, crab and fish. Conversely, blue whales feed by gulping an enormous mouthful of water, and then pushing it back out through thin, overlapping baleen plates which keep the krill trapped inside their mouths; on a good day a single adult blue whale can consume about four tons of krill. The team at Stanford hopes to continue their research, exploring how body size can be explained for other animal groups, especially those that have both terrestrial and aquatic species. “[This research] opens up some possibility that body size can be explained by basic principles of physics and chemistry,” said Payne.